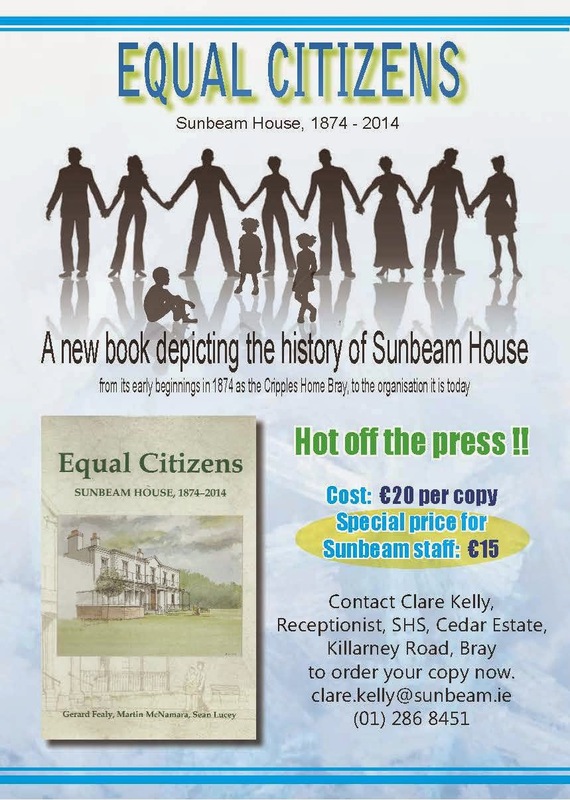 I am pleased to advise that this new hardback book, ‘Equal Citizens, Sunbeam House, 1874-2014’ is now available for sale from Clare Kelly on reception in SHS Killarney Road, Bray. The book was commissioned jointly by Sunbeam House Trust and the Directors of Sunbeam House Services, and was written by Gerard Fealy, Martin McNamara and Sean Lucey. It tells the history of Sunbeam House from the time of its founding as the Home for Crippled Children, to its development as one of the leading voluntary disability service providers in Ireland. Complete with photographs, it is an interesting read and is available at a special price of €15 to Sunbeam staff. Please see the attached poster for further information.